Driven by the growth-inducing tax reform, America is open for business and undergoing solid economic expansion. The 2017 Tax Cuts and Jobs Act lowered the federal corporate tax rate to 21 percent. The sooner Trump acts on that, the greater the American economy will be. Fast forward to August 2018. The United States has indeed leapfrogged other countries and unleashed greater economic growth. The 2017 Tax Cuts and Jobs Act lowered the federal corporate tax rate to 21 percent. 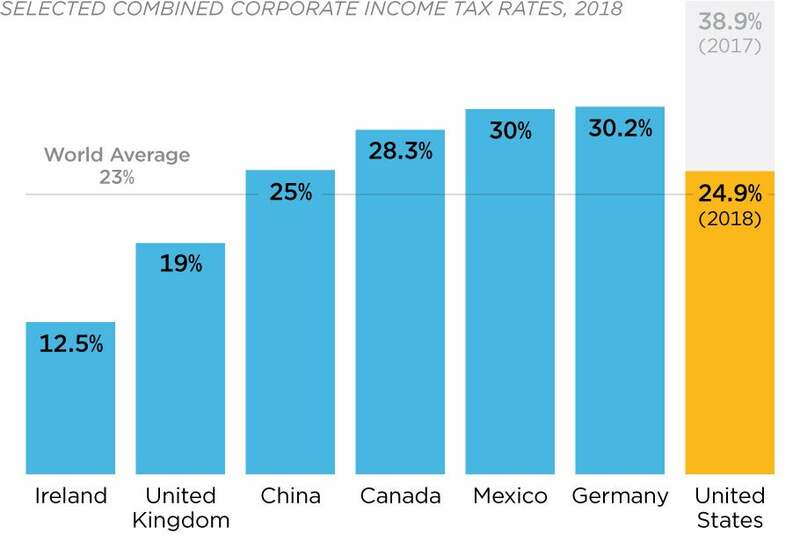 The combined federal and state corporate tax rate fell from almost 40 percent, the highest rate in the developed world, to 24.9 percent, as shown in this chart. The new lower tax rate has made the U.S. economy competitive, enabling its growth to outpace other major economies in a meaningful way. [I]t seems very clear that further tax reforms, both in the United States and around the world are likely to happen in the near future. [Corporate income tax] rates have been falling for decades. In this respect, the U.S. reform is not unexpected, if anything it joined the trend surprisingly late. The IMF study notes that companies will be more likely to realize profits and make new investments in the United States than they were before the tax reform. As underlined in a recent Heritage Foundation tax study, the corporate tax rate cut is likely to produce larger incomes, more jobs, more investment, and, ultimately, more economic opportunity. Now, imagine how much faster and higher the American economy could soar if President Donald Trump would stop undercutting progress with his self-imposed, new growth-hurting taxes in the form of tariffs. Tariffs are a tax increase on American workers and their families. Tariffs do not protect the ‘forgotten men and women’ of this country or bring back jobs. Rather, they could cost current and future American jobs and increase costs on consumer goods. … President Trump has done so much. We need him to do the right thing now: Scrap the tariffs and return his focus to policies that will grow and invigorate the economy to the benefit of all Americans. Indeed, the sooner Trump acts on that, the greater the American economy will be.